On February 14, Berlin Cosmopolitan School hosted the 4th edition of the “One World Many Voices” concert. This year we organised an event which not only hosted our own BCS choir, but also the choirs from the Peter Ustinov Oberschule and the Quentin-Blake-Europe-School. 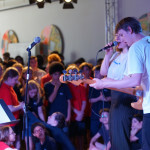 Bands from BCS and the Schiller-Gymnasium in Berlin rocked the house last Thursday for one hour after lunch. All Secondary students were invited to the great rock show in the BCS concert hall featuring the bands “Confusion” and “Sep10ber” from the Berlin Cosmopolitan School and “The Chillerz” from the Schiller Gymnasium. We would like to invite every member of the BCS community to an evening of tunes and dances from many corners of the world, today at 5 pm in the BCS Concert Hall! 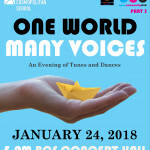 “One World Many Voices” features musicians and students of extraordinary talent from the wider BCS community. Donations on that evening will support “Mit-Mach-Musik”, an organization that helps refugee children to integrate through music. Snacks and water will be provided on donation. The Cosmic Sounds Compilation is a collection of songs, performed by BCS students and recorded in 2017 at the school’s own Cosmic Sound Studio. Some original works and some original interpretations of songs, all tracks highlight the wide array of talent at Berlin Cosmopolitan School.